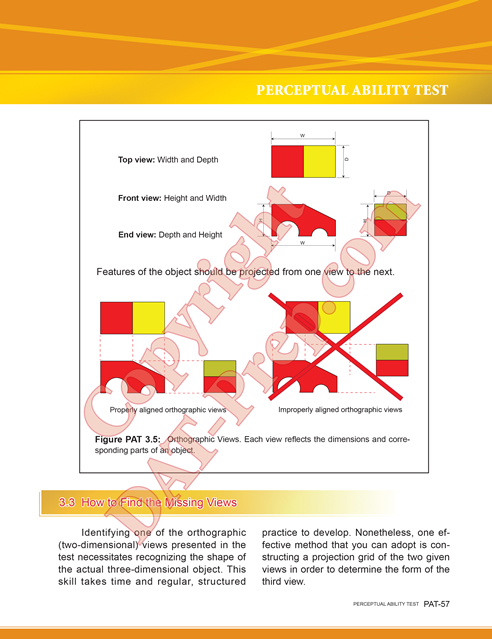 The DAT PAT (DAT Perceptual Ability Test) is one of the four sections of the Dental Admission Test. It has 90 questions and a time limit of 60 minutes. This section is composed of six separate 15-item sections. 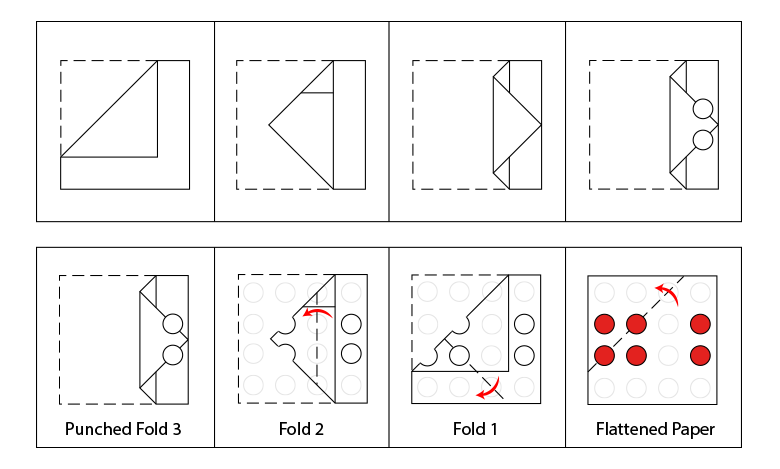 The common and official names of these sections are as follows: (1) DAT keyhole (apertures); (2) DAT TFE or top-front-end (orthographic projection or view recognition); (3) DAT angle ranking (angle discrimination); (4) DAT hole punching (paper folding); (5) cube counting; and (6) DAT pattern folding (3-D form development). For some students, the DAT PAT section is challenging. For some, it is a welcome break from the math and science sections of the Dental Admission Test. 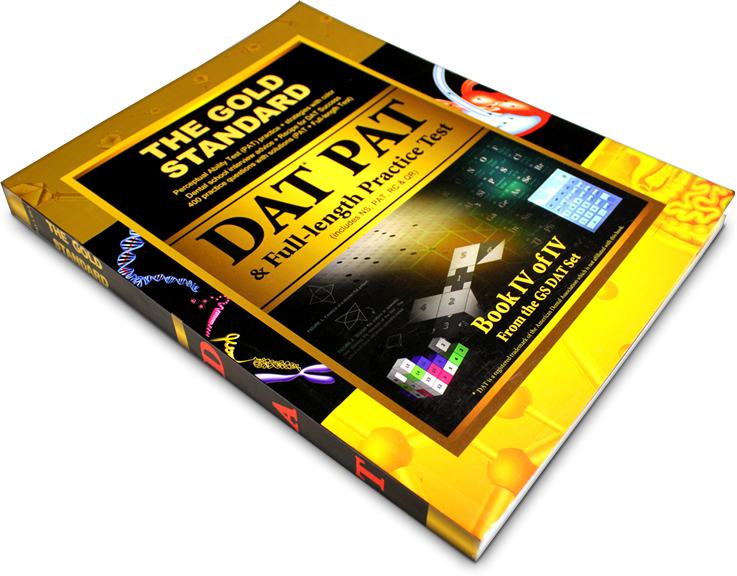 Gold Standard DAT Prep will be able to help you achieve not only a good, but also a high DAT score with our best DAT prep course and materials (books, practice tests and videos). To find out if one’s score is good enough for admittance to your desired dental school, click here: DAT Scores for Dental Schools. general and organic chemistry, PAT, RC and QR) followed by explanations. With this book, you get over 1300 practice questions in the book & online! This book also contains the content covering Canadian DAT PAT. 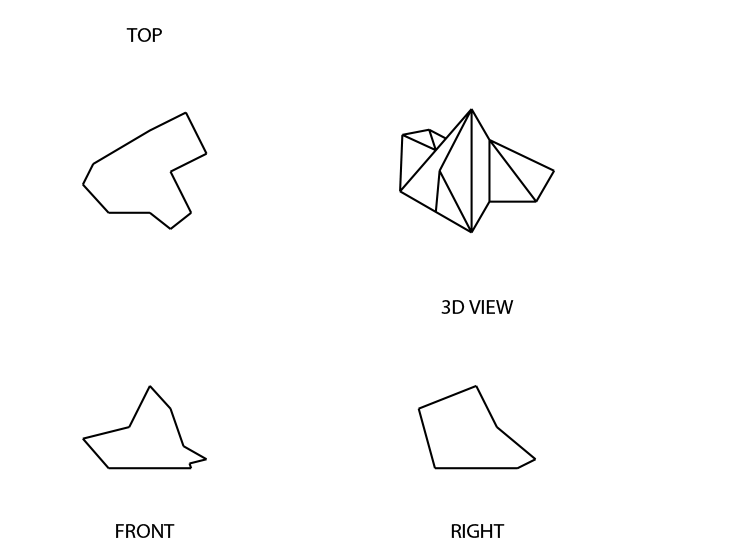 Includes: The best DAT PAT techniques and strategies in perceiving 3D objects in 2D views and vice versa, which are essential to ace the apertures (keyhole), orthographic projection (top-front-end/TFE), and 3D development (pattern folding) tests. 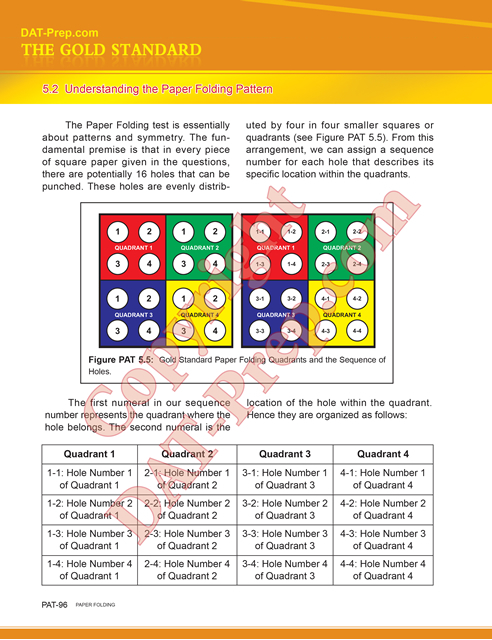 Quick formulas such as the Gold Standard Paper Folding Quadrants (our hole punching/pattern folding trick) and the Gold Standard Cube Counting Formula will help you become more time-efficient. We also present helpful angle ranking tricks so, with practice problem sets, you can choose which works best for you. This study guide also comes with online access to PAT videos, hundreds of practice questions, and DAT PAT problem sets in the book and online for the original owner. The following video tutorials will introduce you to the basic concepts and strategies of the different PAT sections. To view the complete playlist of our PAT video tutorials or get notified of our new DAT videos, you may want to subscribe to our YouTube channel: Gold Standard DAT. If you need more challenging PAT practice tests, you may proceed with our free DAT PAT practice questions below or register for our free DAT practice test. 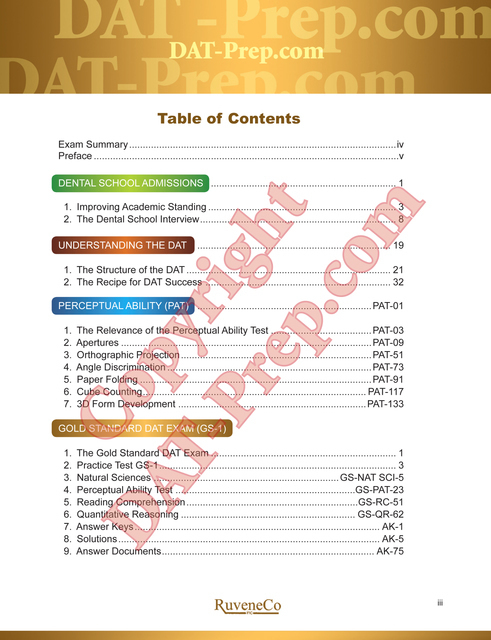 The link below gives you access to a free DAT PAT practice test - it is composed of 30 DAT PAT practice questions which is one-third of the real exam. It mimics the interface and format of the real DAT and comes with answers and explanations. After clicking the link to the exam, a window will pop, and you will find a button on the upper right corner of the window that gives you an option to use the timer or not during your practice test. This option is not available in the real exam. If you do not want to use the exam interface by clicking the button above, we have placed our sample DAT PAT practice questions below with the instructions for each section followed by answers and explanations. Good luck! The given object may be entered through the aperture from a direction that is different from the one shown in the question. Once the object is introduced to the opening, it must pass completely through the hole without rotating the object in any direction. 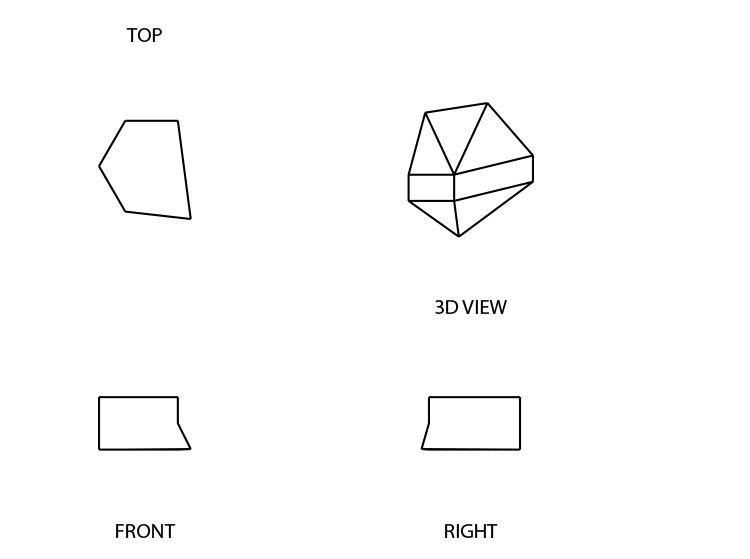 Both the three-dimensional object and the corresponding apertures are drawn to the same scale. It may be possible for an aperture to have the correct shape yet too small or too big for the object. However, the differences are large enough to be seen by the naked eye. No irregularities are hidden in any portion of the object. In case the figure has symmetric indentations, the hidden portion would be symmetric with the visible part. For each question, only one aperture matches the exact shape and size of one of the two-dimensional views of the object. For the object to pass all the way through the aperture it has to be rotated first at 180 degrees from right to left and then, the side on the right is inserted first. 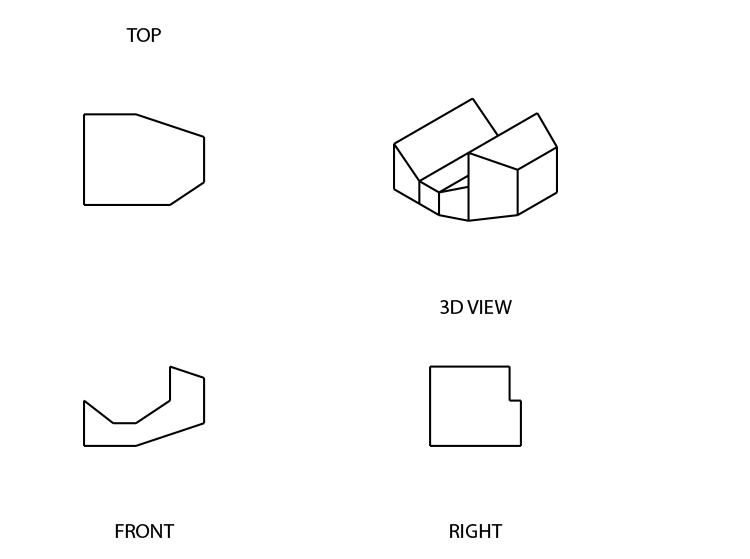 For questions 6 through 10: The following figure shows the top, front, and end views of a basic solid object. These are flat perspectives of the object where only points along the parallel lines of the object's surface are shown. The projection looking DOWN on the object (TOP VIEW) is in the upper left-hand corner of the illustration. The projection looking at the object from the FRONT (FRONT VIEW) is in the lower left-hand corner. The projection looking at the object from the RIGHT side (END VIEW) is in the lower right-hand corner. The positions of these views are ALWAYS the same in each question and are also labeled accordingly. Points that are not visible on the surface of the object in a particular view are represented by DOTTED lines. In the succeeding questions, two views are presented, followed by four options to complete the set. Pick the correct choice that corresponds to the missing view and mark it on the answer sheet. 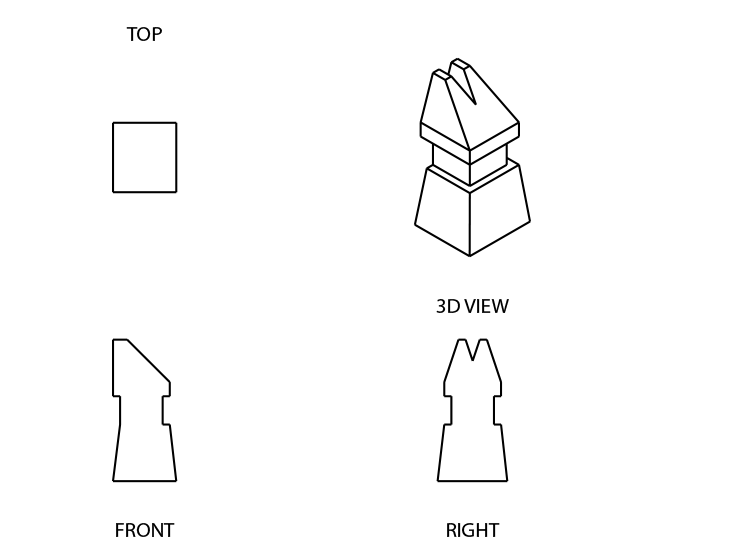 Example: Choose the correct END VIEW. The front view shows a smaller block on the base and no hole (because no dotted lines a shown). The top view shows that the block is a square and located on the upper left corner of the base. These characteristics correspond to the outline shown in option C if viewed from the right side of the object. Please note that the problems given in the succeeding items do not always require you to choose the end view. 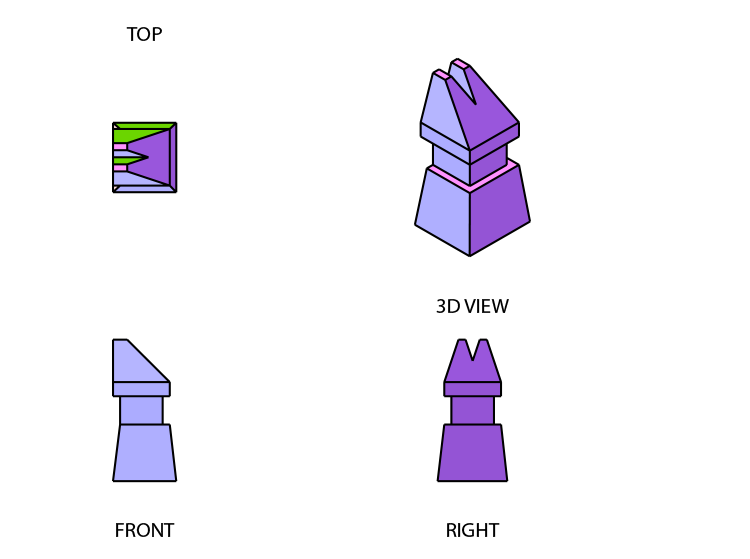 The top view or front view may also be asked. For questions 11 through 15: This section requires you to evaluate the four INTERIOR angles and rank each item from SMALL to LARGE in terms of degrees. From the alternatives, select the one with the correct order. Indicate your choice on the answer sheet. The correct order of the angles from small to large is 4-2-3-1. 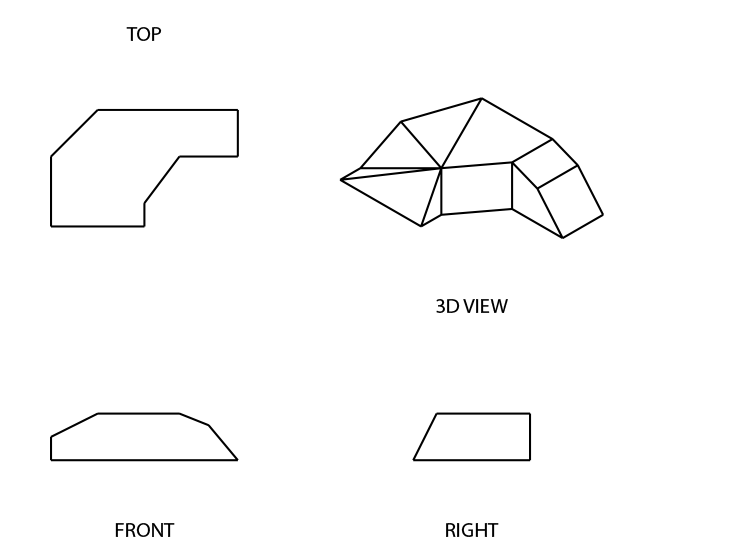 For questions 16 through 20: Each question in this section presents the following scenario: A square-shaped paper is folded one or more times. The broken lines in the next figures represent the main outline of the paper; the solid lines signify the position of the paper as it is being folded. Take note that the paper is never turned or twisted. 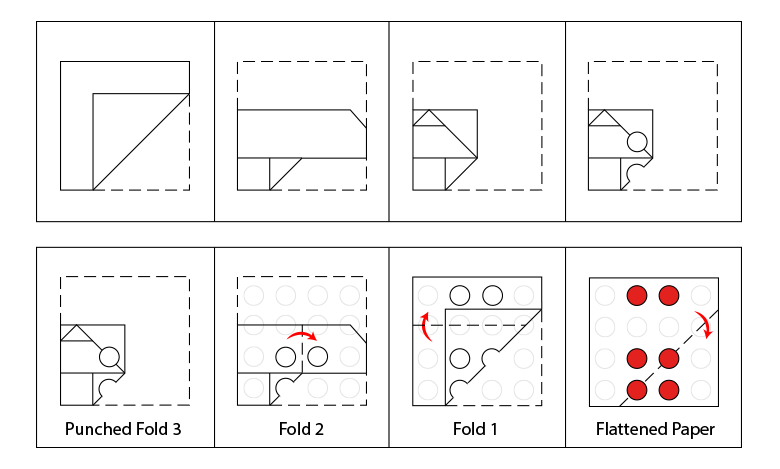 This means that the folded paper always stays within the boundaries of the original square. Each question shows the paper folded multiple times. After the last fold, the paper is punched with a hole. 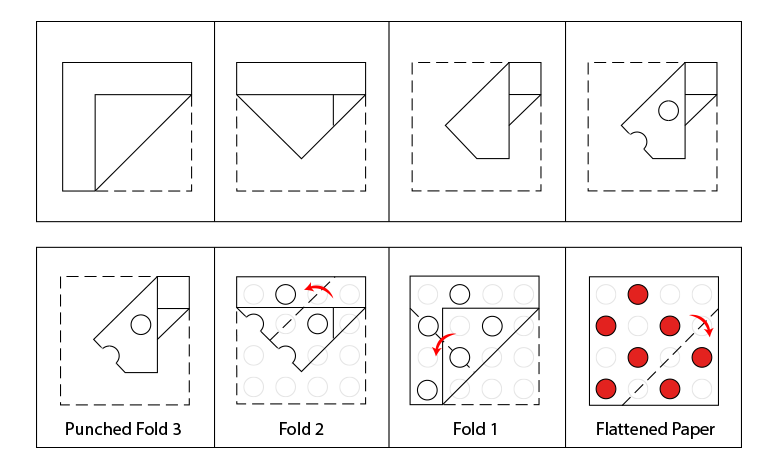 Your task is to visualize unfolding the paper and identifying the position of the holes on the unfolded square. Only one pattern is correct for each question. 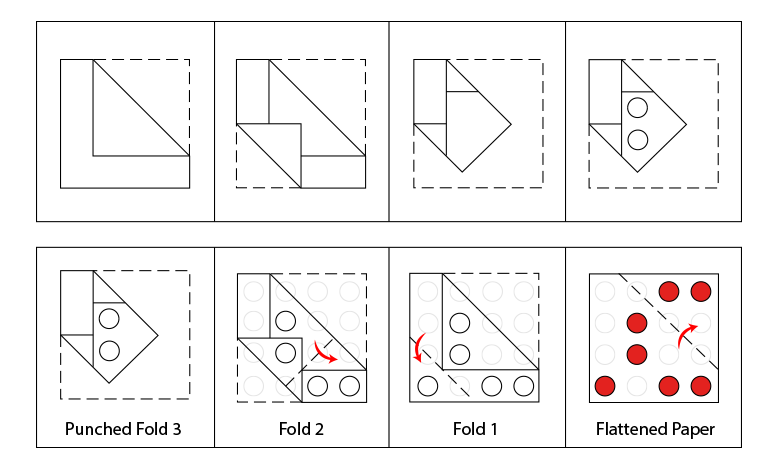 In Example 1, Figure A shows the unfolded paper. 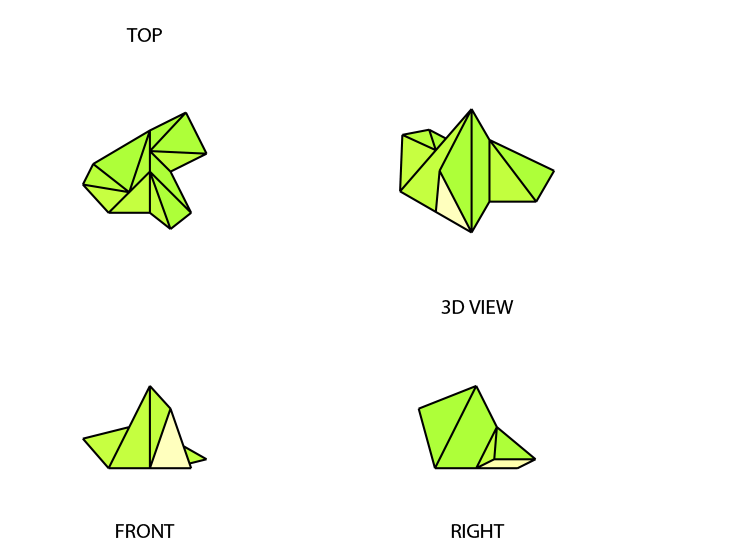 Figure B shows the paper now folded in half. 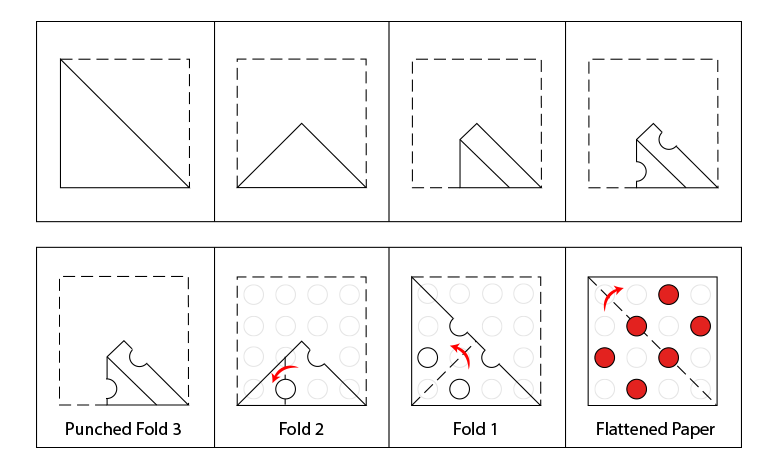 Figure C shows where the hole is punched on the folded paper. Figure D shows the resulting pattern of the holes, indicated by the darkened circles, on the original square. Example 2 shows how a question appears on the test. The correct answer is B. The paper was four layers when punched, resulting to the holes placed in each of the four corners. 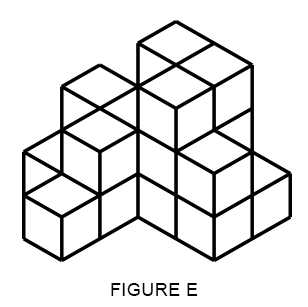 For questions 21 through 25: Each figure is constructed by stacking cubes on top of each other. Once they are stacked, all of the exposed surfaces, excluding the bottom surfaces, are painted. The number of painted sides per cube can range from zero to five. Do not forget that there are cubes "hidden" behind the other cubes. 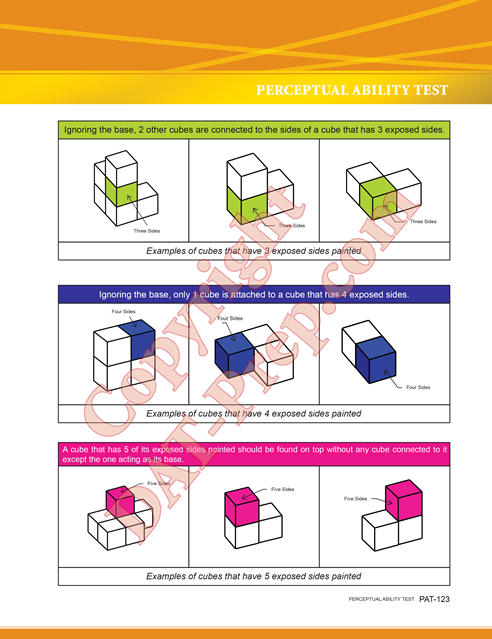 For the questions in this section, you are required to evaluate each figure and conclude how many cubes have: only one of their sides painted. only two of their sides painted. only three of their sides painted. all five of their sides painted. Remember: No problem will have zero (0) as the correct answer. There are four cubes in Figure 1. Three are visible, and one is hidden supporting the top cube. 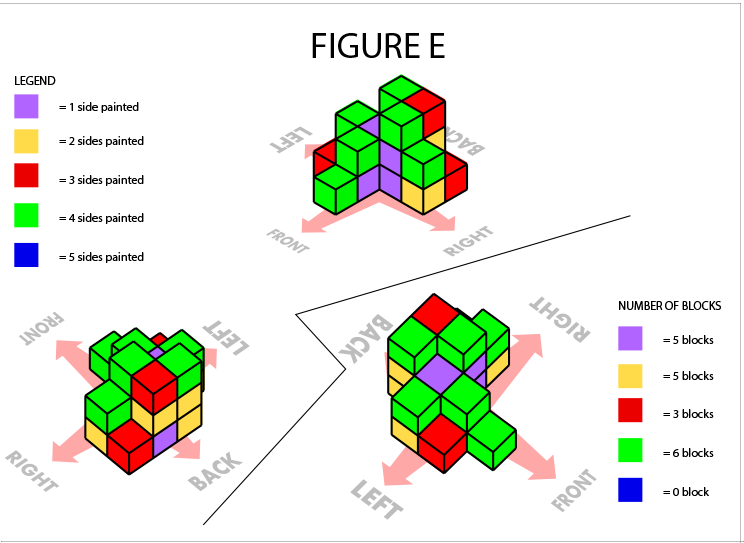 Two sides of the invisible cube are painted; five sides of the top cube are painted; and for each of the remaining two cubes, four of their sides are painted. Note: The numbers in the cubes indicating the number of exposed sides shown in the sample (Figure 1) are not shown in the actual questions. However, it is important to remember that after the cubes are stacked together, each one is PAINTED ON ALL VISIBLE SIDES EXCEPT THE BOTTOM. 21. In Figure E, how many cubes have one of their exposed sides painted? 22. In Figure E, how many cubes have two of their exposed sides painted? 23. In Figure E, how many cubes have three of their exposed sides painted? 24. 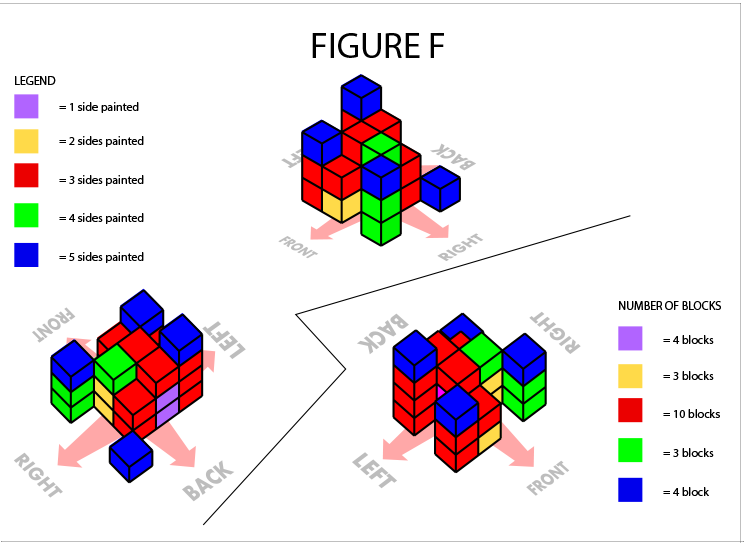 In Figure F, how many cubes have two of their exposed sides painted? 25. 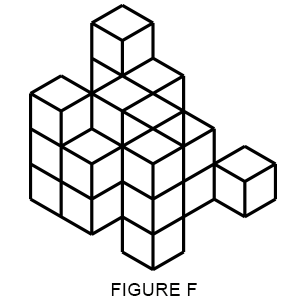 In Figure F, how many cubes have four of their exposed sides painted? 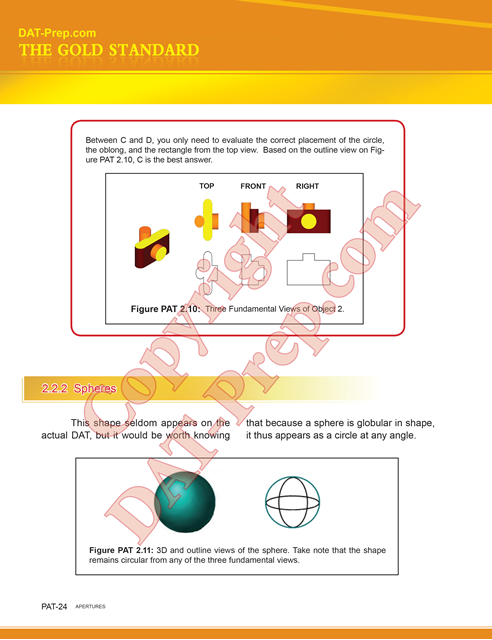 For questions 26 through 30: Each question in this section will present a flat pattern, which will then be folded into a three-dimensional model. Four options of the resulting actual figure are given. Only one model is correct in every set. 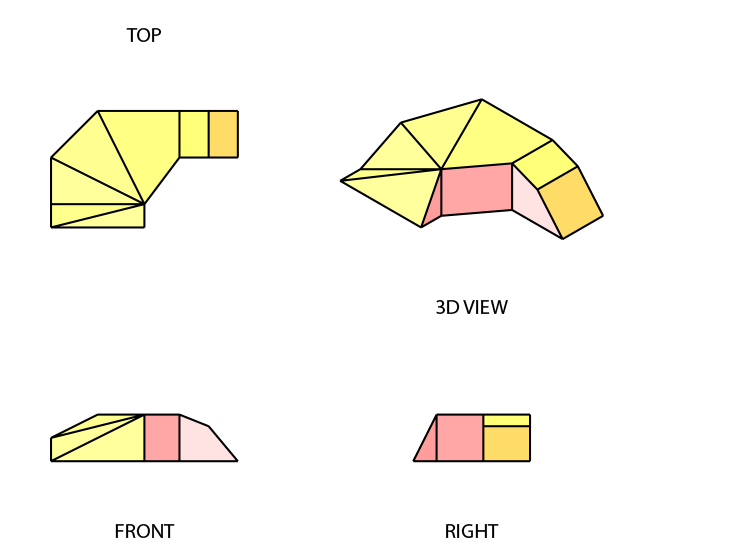 Some figures will have shaded portions similar to the pattern shown in the example below. 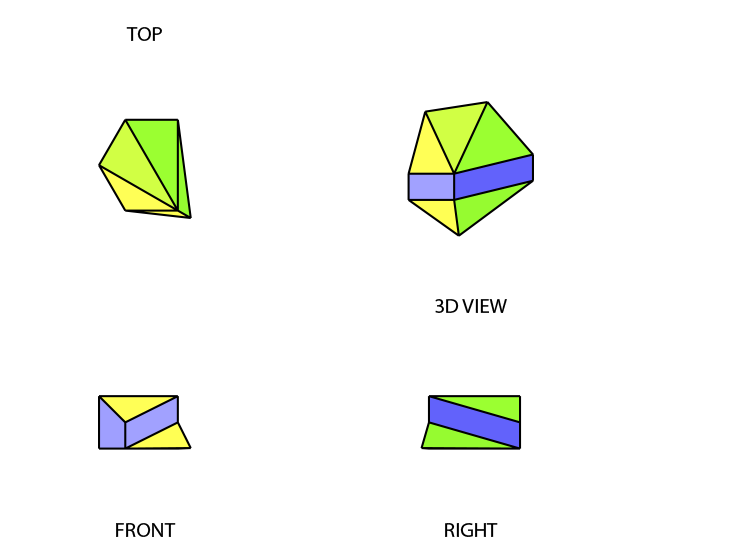 The shaded areas are not necessarily the "sides" of a figure. They can be the top or the bottom of the figure as well. 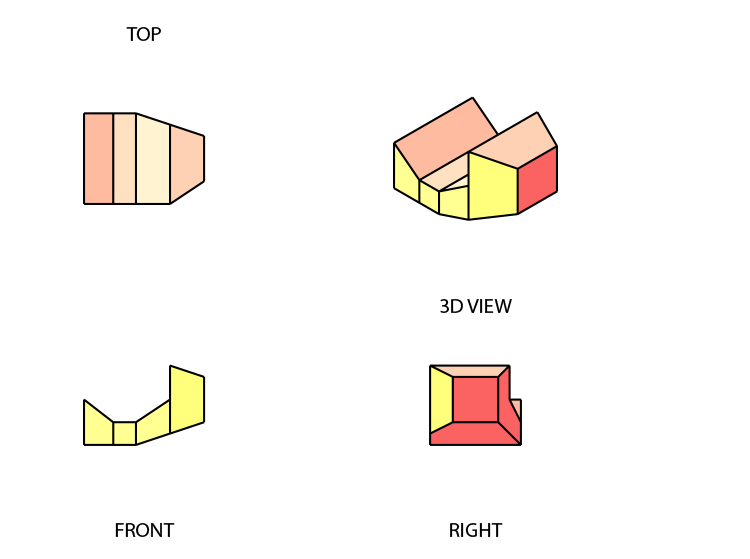 From the given figures A, B, C, or D, the shaded parts obviously form as the sides of the box. The resulting model will then have all four sides shaded while the top and bottom will be white. This makes A the best answer. 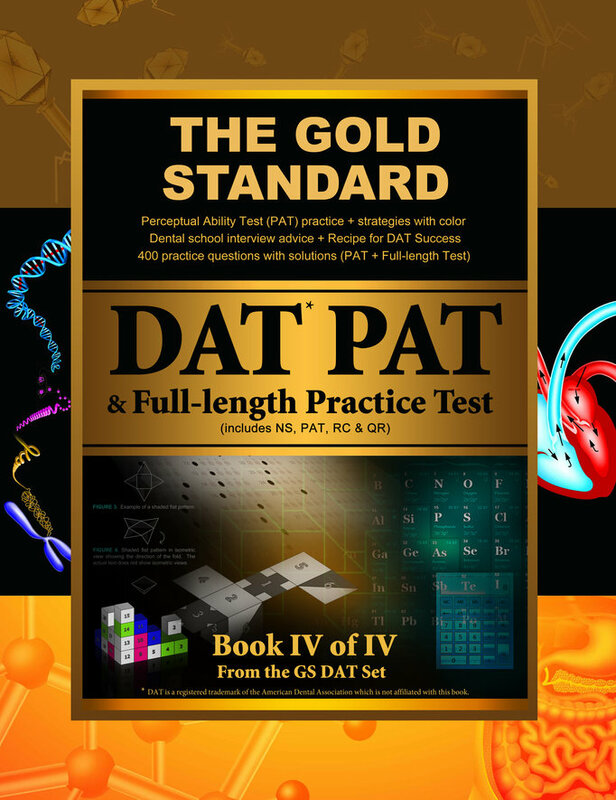 For more free DAT PAT practice questions PLUS 1-hour free access to DAT Natural Sciences videos online, register here: Free DAT-prep User Account.